While exploring the narrow streets of Varanasi, I met a captivating older woman who was full of joy and happiness despite her modest lifestyle. 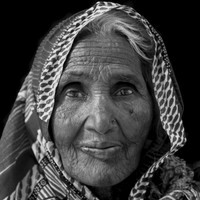 Her face and eyes were mesmerizing and captured her life journey. She was very gracious and delighted to have her photo taken.